If you are writing a story related to fire in our forests, or just want to learn more about fire ecology please check out the resources below. Otherwise scroll down to view Staff Articles, News Stories and Radio and Television Coverage related to our efforts to protect National Forests. Fireside Chat was prepared for the media, managers, conservation groups, and decision makers using the Prezi presentation software and storytelling tool. 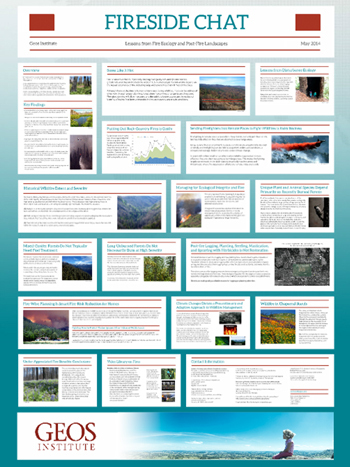 Featuring key issues regarding fire ecology, including the ecological benefits of high intensity fire to native biodiversity in western forests, the ongoing deficit of high intensity fire due to fire suppression, and the threats to wildlife species and ecosystems from the removal of post-fire habitat. A comprehensive synthesis of the scientific evidence on forest fire trends, and the relationship of current fire patterns to wildlife and climate change. Including how many acres actually burned at what intensity, what happened in areas that had been previously thinned or had not burned in a very long time, how the logging targets sensitive areas and removes rare habitat, and the prevalence of spotted owl occupancy in the areas scheduled for logging. There are now 66 million dead trees in California’s forests due to several years of drought and native bark beetles. Stirring up fear to promote increased logging and funding from Congress, U.S. Secretary of Agriculture Tom Vilsack claims that these trees create a “catastrophic” wildfire threat. The science disagrees. Dead trees in our forests do not increase fire risk, they create rare and extremely biodiverse habitat necessary for the health of our forests and California wildlife. While politicians such as Senator Feinstein and Governor Brown are using natural processes such as fire and increases in native bark beetle populations to propose tax payer funded increases in logging across State and Federal lands, the science is telling us this is the wrong way to go. When Americans think about the presents they want for the Holidays, clearcuts on our national forests and other federal public lands is not what they have in mind. But that is exactly what radical, anti-environmental members of Congress are proposing to do right now — make a generous gift to the logging industry. It is a cynical rule of politics that, if you get people sufficiently scared and confused, many can be persuaded to agree to some of the worst and most irresponsible ideas. Case in point, the threat that has emerged this week from Senate Republicans . . .
As two forest ecologists and a firefighter, we view forests as a dynamic ecosystem, see fire as nature’s circle of life, and promote coexistence with backcountry fires rather than relentlessly fighting them. While the news media and Congress each year proclaim burnt forests from Yellowstone to the Sierra and Cascade Mountains as unprecedented catastrophes, we see nature’s remarkable resilience at work. We seek a rational conversation especially now as fire season has died down. The timber industry makes a lot of money clear-cutting our national forests after fires, so it’s no surprise that it takes some liberties with the facts. The logging industry claims that where fires burn most intensely, the forest does not naturally regenerate, suggesting that post-fire logging is needed to generate revenue for artificial tree planting. This is a myth. Scientific studies consistently find vigorous natural regeneration of conifers and oaks in high-intensity fire patches. . . The Rim Fire blazed through the alpine forest of California's Sierra Nevada in 2013, growing into one of the largest and most expensive wildfires in the state's history. Today, many researchers are racing to discover how this new fire regime is affecting California's diverse landscapes, from the highest subalpine forests to shrubby chaparral. California’s forests could benefit from more fires, according to scientists and state officials tasked with protecting people and property from high-intensity blazes. The state’s ongoing epidemic of dead or dying trees has stoked fears about increased wildfires, but scientists and state officials agreed the dead wood may not be the threat many believe. Rather, they expressed the need for longer-term strategies to protect backcountry homes and businesses. Focus: Do Dead or Dying Trees Raise WildFire Risk? As a record number of trees stand dead or dying in California’s forests due to drought and beetle infestations, concerns are mounting that the die-off is creating an abundance of fuel likely to trigger wildfires that could threaten homes and lives. However, an emerging body of science finds little evidence to support these fears. As wildfires burn in Southern California, a debate is smoldering about what to do with millions of dead and dying trees — which have been ravaged by drought and beetle species up and down the state. A little more than a week ago, I drove into Yosemite National Park for a week-long, California Master Naturalist immersion course. I was euphoric, about to sequester in beauty to study deeper levels of what Shakespeare called "nature's infinite book." Heading in from Oakdale, mile upon mile of mountainous hillside was covered in rusty brown dead trees. . . . The California landscape evolved with lightning-strike fires, and Native Californians used fire to manage their food sources, both animal and vegetable. We have been suppressing fire and battling fire on the landscape for more than a hundred years, with the idea that it is a destructive force to contain. We have stopped a natural cycle from turning - for the moment. Congressional Republicans are pushing two bills, supported by the timber industry, that would speed up logging in national forests after wildfires and reduce environmental review, despite science showing timber salvage harms essential wildlife habitat. Forest Ecology with Chad Hanson, Ph.D. Conversation about the importance of low, moderate and high intensity fire for forest ecosystem health in California. Rarer than old-growth forest and just as biodiverse, lets' let science guide management rather than fear. 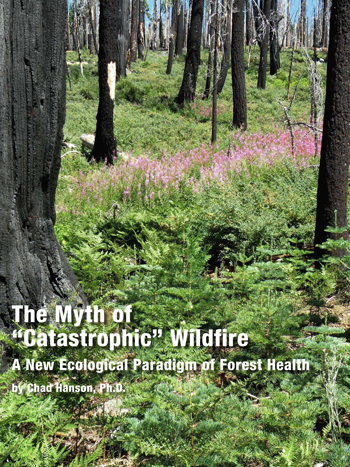 Chad Hanson debunks myths about fire in our forests and talks about his new book The Ecological Importance of Mixed-Intensity Fire: Nature's Phoenix. Following a Prius up a dirt forest road, I daydream a bit behind the wheel. It's a pretty place: black oaks starting to show a little fall color, tall willows fringing the backs of Grout Creek, sun-warmed granite boulders showing between the trees. Scrub jays dart noisily between the trees as I pass, flashes of blue glinting off their wing feathers. This month I had the opportunity to hike into the Aspen Grove which burned at high intensity on the San Bernardino National Forest during the Lake Fire. I'd expected the Lake Fire's high intensity burn area to be somber, promising renewal only in the abstract for people who could spot subtle signs of recovery. Instead, the place is cheerful, the life in it exuberant. Numerous scientific studies, including one by NASA, demonstrate that trees that die as a result of an increase in Bark beetle populations do not increase the risk or intensity of wildland fire in western forests. These native beetles enhance our forest ecosystems and should not be the scapegoat for misinformed forest management and misguided legislation. John Muir Project Director Dr. Chad Hanson informs Cara about current legislative efforts to deregulate logging in America's forests. Myths are also busted regarding forest fires.